These findings are described in the article entitled Structural equation modeling of food craving across the menstrual cycle using behavioral, neuroendocrine, and metabolic factors, recently published in the journal Physiology & Behavior (Physiology & Behavior 195 (2018) 28-36). This work was conducted by Sridevi Krishnan, Karan Agrawal, Rebecca R. Tryon, and Lucas C. Welch from the University of California Davis, and William F. Horn, John W. Newman, and Nancy L. Keim from the University of California Davis and the USDA ARS. It is well accepted that endocannabinoids are the compounds that cause “munchies” associated with marijuana. Munchies are intense food cravings and endocannabinoids (anadnamide (AEA) and 2-arachidonoylglycerol (2-AG)) are well-known appetite enhancers. We did a study in women to find out whether these endocannabinoids and endocannabinoid-like chemicals were associated with increased cravings during specific times of their menstrual cycle. The menstrual cycle in women is a 28d cycle (on average); starting from the bleeding phase, the first 14 days before ovulation constitutes the follicular phase, and following ovulation is the luteal phase till the next period begins. Several hormones, including estradiol and progesterone, fluctuate and bring about this cycling. During the luteal phase, several women report increased caloric intake and increased cravings for calorie-dense foods (high fat, high carbohydrate/sugar). This increased food intake can contribute to what is known as “creeping obesity,” resulting in overweight/obesity. Estradiol is understood to suppress food intake, but the effect of other hormones on the luteal phase craving is not well understood. We studied premenopausal women during one entire menstrual cycle and tested them once during their follicular phase and once in their luteal phase. During these tests, we measured several independent components of their metabolic state: hormones (estradiol, progesterone, DHEAS, leptin), endocannabinoids & a whole slew of endocannabinoid like chemicals, and clinical factors (glucose, insulin, lipids) in blood. We also asked them to record their craving for carbohydrate-rich, fat-rich, or sweet-tasting foods in their luteal phase. We used structural equation modeling to identify which of these factors measured in blood were causally associated with craving for calorie dense foods. The advantage of using structural equation modeling is that it can identify independent variables (any of the four factors listed above) predicting the outcome variable (craving) while controlling for correlations between the independent variables. We identified that progesterone positively contributes to carbohydrate-rich food craving while circulating glucose and lipids contribute to reduced craving sweet-tasting foods. 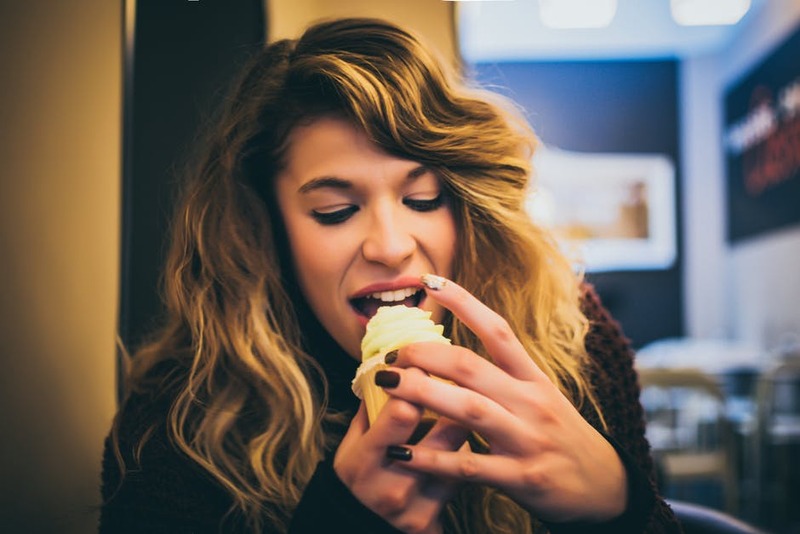 Anandamide (AEA) positively contributed to craving sweet-tasting foods, while oleyoylethanolamide (OEA – a fatty acid derived endocannabinoid-like-chemical) contributed to a reduced craving for sweet-tasting foods. OEA has been called the anti-obesity endocannabinoid, due to its “satiety” inducing effects, and is known to oppose the effects of AEA via engaging cannabinoid receptor 1 in the brain. A few pertinent observations during our modeling process – the metabolic state of a woman in the follicular phase was better at determining luteal phase craving than concurrent luteal phase metabolic state. This suggests that the metabolic state leading into the luteal phase may have a large effect on food cravings later in the menstrual cycle. Also, we identified that a combination of endocannabinoids, hormones, and clinical factors were better at predicting craving than each group of factors alone. This suggests that changing any of these factors can affect cravings. Not surprisingly, some women on oral contraceptives that affect estradiol or progesterone in the blood often experience alterations in food intake and craving behaviors, as well as body weight change. It is of interest to note that endocannabinoids and endocannabinoid-like chemicals can be changed by dietary fat composition because they are primarily fatty acid derived mediators. For instance, OEA can be increased in blood by increasing consumption of oleic acid, with olive oil being the most common source of this. Similarly, AEA, (which is arachidonoylethanolamide – derived from arachidonic acid) can be reduced by altering dietary polyunsaturated fatty acid intake as well. The next step in our work, which we have undertaken, is to alter dietary fatty acid intake during the follicular phase of women and monitor craving behaviors during the luteal phase of the menstrual cycle. Sridevi Krishnan is an Assistant Project Scientist, Department of Nutrition at UC Davis. Her current research focuses on combating (prevention and management) cardiovascular disease, type 2 diabetes, and obesity in women by exploring dietary, exercise and lifestyle habits, especially focused on personalizing changes to optimize health solutions.